I think so ... @davidfestal ? Not sure what this means @gavinking . If i did a normal Java project and wanted to export it as a Jar...This is the option Eclipse gives me. I seem not to see the "Something Something Fat jar". The "fat jar" from Ceylon perspective comes only when i do "Run as". 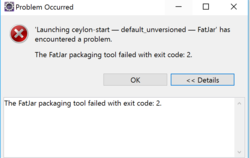 @gavinking That was my thinking on("Or I guess running it as a fat jar will produce a fat jar as a side-effect")...but I don't see any activity on that on Eclipse. @gavinking , Okay a few things i just observed. I created a new Ceylon project. Now, when I did the "run-as-fat-jar" from the compilation unit perspective i.e I right click on the compilation unit and "run-as-fat-jar". Upon referesh, I see two files generated namely: ceylonb and ceylonb.bat. When I "run-as-fat-jar" from the project perspective i.e right clicking on the project name . I get the error i posted earlier. @pkkamos_twitter would you try with the CLI please? A quick check from eclipse shows that the change was not effected...was still showing 8 on the SE modules. do you have a console view related to the generation of the fat-jar ? No. The only detail is what I have captured in the image above. @pkkamos_twitter but did you try running ceylon fat-jar from the command line, to see what messages you get? @gavinking I will be trying the CLI shortly. Running from CLI was successful. @davidfestal and @gavinking I will still wait for the Eclipse fix though...I am not a lover of CLI...hehe. @pkkamos_twitter could you try putting your code in a real module ? Okay. let me try that. 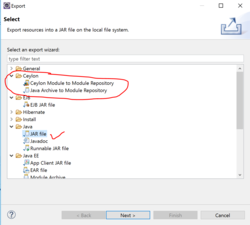 you want to add module descriptors for default modules? @davidfestal it seems the ceylon command is not able to create any other module from CLI apart from "default"
@pkkamos_twitter you have to put your sources in a sub folder called "testmod" inside "source"
@quintesse let me try that. @quintesse ceylong new module testmod has created the module testmod nicely. @pkkamos_twitter what is the fatjar command you used to generate the jar? And does the testmod contain a method called modhello? Like this ceylon fat-jar --run=testmod::modhello testmod? Yes. That's exactly what i did. @pkkamos_twitter are you able to run the code without the fat jar? By running ceylon run --run=testmod::modhello testmod? It's fine when the module is "default"
ceylon run: Could not find toplevel function 'testmod::modhello'. need to be fully qualified, maybe you meant 'testmod::modhello'? or the package is not shared, that could be it as well, right? Still same results...maybe i will take a break and try again....lol! Hahaha....this is the only code. Nothing fancy. and if you change the name of modhello() to run()? Remember when the module was default....it ran nicely. I definitely will try again later in the day. Great learning experience for me though! Well yes, but it shouldn't be this hard! I know this is very strange. Got me stumped. @pkkamos_twitter and modhello() is really there in source/testmod/xxxx.ceylon? you don’t have a strange filename or something? and your modhello() is inside the run.ceylon file? // on the command line compile with "ceylon compile testmod" or "ant compile"
// and execute with "ceylon run testmod/1.0.0" or "ant run"
Well, where is your modhello() method then? The Utility that generated this must tell us...don't you think so? heheh. how did modhello() turn to run()? I moved the modhello.ceylon into the testmod folder. That's all I did...works now. Thank you once again! Will be looking out for the "fat-jar" on Eclipse as well. Okay...Please, what's the exact link/url? @davidfestal are you sure about that? is there an issue for that already? select, you mean, in the Ceylon Explorer ?